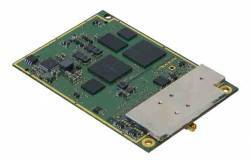 Septentrio has announced that the Belgian GNSS manufacturer has successfully tracked the GLONASS CDMA L3 signal transmitted by the first GLONASS-K1 satellite using the company’s AsteRx3 receiver. Launched on February 26, the GLONASS-K1 carries a payload capable of transmitting for the first time a code division multiple access (CDMA) signal in the GLONASS L3 band — center frequency of 1202.025 MHz — in addition to the standard L1/L2 GLONASS frequency division multiple access (FDMA) signals. One of two planned K1 satellites, this is the first GLONASS satellite capable of transmitting a CDMA ranging signal. 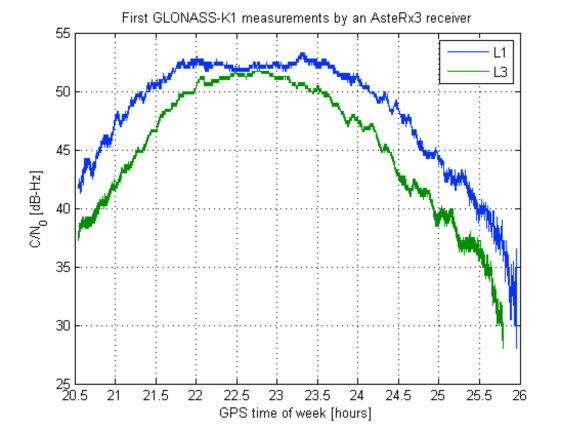 “We are proud to announce that during the last weekend we have succeeded in the tracking of the GLONASS L3 signal and in the generation of the full set of user-level measurements (code minus phase, Doppler, C/N0) with our commercial receiver, AsteRx3,” Frank Boon, Septentrio’s head of research, told Inside GNSS. The GLONASS system has traditionally employed FDMA, in contrast to CDMA employed by all the other GNSS systems. However, CDMA signals in multiple frequency bands will be broadcast by future GLONASS satellites. The GLONASS-K1 satellites mark a first step in this direction. On April 7, the GLONASS Information-Analytical Center announced that experimental navigation signals of the first GLONASS-K1 satellite would be activated. Septentrio’s AsteRx3 receiver is now successfully tracking the new L3 CDMA signal broadcast by the satellite as well as its L1 and L2 signals (L1-C/A, L1P, L2‑C/A and L2P), according to Tom Willems, Septentrio senior GNSS engineer, and Jean-Marie Sleewaegen, who is responsible for the GNSS signal processing, system architecture and technology development at Septentrio. The accompanying Figure 1 shows the C/N0 in dB-Hz of the legacy L1-C/A signal and of the data component of the new L3 CDMA signal. The graph covers the time span starting at 20:30 (UTC) on April 10 and ending at 02:00 (UTC) on April 11. The second graph shows the de-trended code minus phase from L1-C/A and L3 signals, which provides a glimpse at the code measurement multipath and noise, according to the Septentrio engineers.